When it comes to their Kitchen and bath hardware, ANZZI remains committed to offering high quality products featuring industry-leading design. ANZZI's new Echo Series wall mounted showerhead and bathroom faucet set features an attractive European bath fixture design that can complement any decor style. A spokesperson for the company stated, "We always stay committed to introducing the latest in European bath fixture design to the North American home. This all metal combination of high quality materials ensure you will enjoy a flawlessly performing faucet for many years to come. The deceptively simple single handle design allows for complete and easy control of both water flow and temperature while maintaining the fine minimalist aesthetic to match with any modern or contemporary decor style." The showerhead and bath faucet has a lustrous polished chrome finish and is manufactured using RHINO alloy certified brass to make them rust resistant. Its compact size makes it perfect for wall mounted installation. The unique modern European design meets high engineering standards, and comes with a lifetime warranty as well. ANZZI's design group is recognized for world-class craftsmanship being executed in the production of their exceptional quality kitchen and bath hardware. Their products are designed to meet the standards of durability, while also exhibiting an attractive design. The company majorly specializes in creating high-end and luxury kitchen & bath faucets, shower panels, and bathtubs, offered in a myriad of styles, shapes and sizes. "We strive to craft unique and timeless works of art to be admired and enjoyed for generations to come. Marrying the timelessness of old world charm and function with the latest new century technology and styles ANZZI has crafted a philosophy centered on an enduring legacy of quality, inspired design, and trending innovation," the spokesperson emphasizes, "Holding to this philosophy ANZZI has incorporated the talents of the world's most creative minds developing a concept of design that continuously breaks away from the mundane." 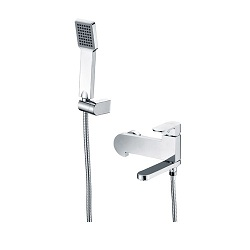 The minimalistic handle design ensures easy operation and gives you a refreshing, full body shower. The product will ship from the factory within 24 hours of processing the order. The Echo Series is also cUPC certified for installation in North America.